As President Trump completes his sixth month in office, one area that has been deeply impacted by his Administration has been refugee resettlement. Tied to his so-called Muslim travel ban, President Trump has sought to block refugee resettlement for 120 days and cap the number of refugees accepted this fiscal year at 50,000—reduced from 110,000 refugees that President Obama was on target to resettle prior to the change in administrations. The result has been devastating to refugee resettlement agencies that are almost entirely dependent on the modest fees that they earn through federal contracts resettling refugees. Refugee resettlement agencies have been forced to lay off staff, with most laying off (or transferring to other jobs outside of refugee resettlement) more than half of the team that was actively working to help refugees build new lives in our region. Pausing the U.S. acceptance of refugees and reducing our role as global leader in addressing the world’s refugee crisis (currently consisting of over 50 million refugees—the largest number of displaced persons since the Second World War) raise important questions about what Americans aspire to be as a nation – presenting an America in fear and disengaging from the world. Completely absent from the discussion, however, has been an analysis of the economic impacts that this policy has on local metropolitan areas in the Midwest and industrial Northeast. 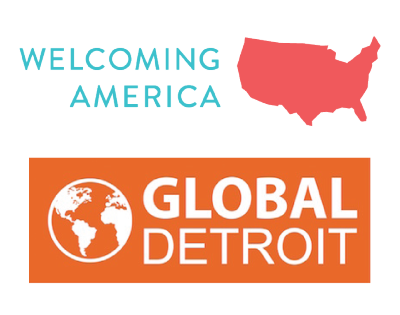 From Syracuse and Utica, New York to Fort Wayne, Indiana, many communities throughout the Welcoming Economies Global Network have seen significant economic and community revitalization benefits from refugee resettlement. 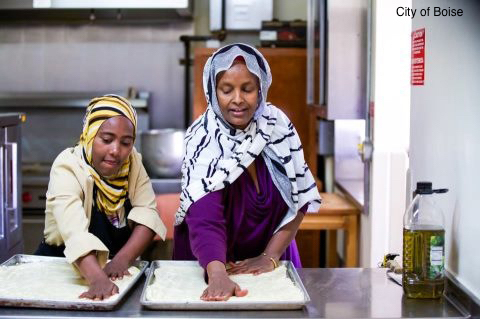 Last month, our friends at the New American Economy released “From Struggle to Resilience: The Economic Impact of Refugees in America” documenting the tremendous economic contributions that refugees make to the communities in which they resettle. It is simple economics that growing the population helps grow the economy, especially in developed countries with declining birth rates, and in older industrial Midwestern states like Michigan, Ohio, Pennsylvania, Indiana, Minnesota, and Missouri. In Michigan, the only state to have lost population in the 2010 Census, more than 35,000 refugees were resettled over the past 10 years. In fact, since 2010, Michigan’s population has been growing and immigrants (of which refugees are an important subset) account for all of the growth. (Michigan’s population grew 50,000 over this time, while Michigan’s immigrant population has grown by more than 64,000 residents, essentially accounting for all of the growth). The graying of America is an issue deeply challenging to state and local economies across the Rust Belt. Most estimates project that the U.S. will be nearly double the percentage of our population that are senior citizens between 2000 and 2030, with many Rust Belt states soon being among the nation’s oldest states. Refugees, however, are much more likely to be of working age and the NAE report found that an estimated 77.1 percent of refugees are working-age, compared to the just 49.7 percent of the U.S.-born population. Refugees are entrepreneurial. The U.S. was home to more than 180,000 refugee entrepreneurs in 2015 whose businesses generated over $4.5 billion in business income. Refugee were almost 1.5 times more likely to be entrepreneurs than the U.S.-born population, rates even higher than the average immigrant communities. A full 13 percent of refugees were entrepreneurs in 2015, compared to just 11.5 percent of non-refugee immigrants and 9.0 percent of the U.S.-born population. Refugees are contributing members of the workforce. While it can take several years for refugees to fully integrate and realize their full economic potential in their new homeland, over time they become significant drivers of our prosperity and economic growth. The NAE report found that refugee household incomes more than tripled in the 25 years after arrival, growing far faster than other immigrant groups. By the time a refugee has been in the country at least 25 years, their median household income reaches $67,000—a full $14,000 more than the median income of U.S. households overall! The NAE report notes that several Rust Belt state’s are among the nation’s most benefitted by refugees spending power. New York, Illinois, Minnesota, Pennsylvania, and Michigan (five of the ten WE Global states) are among the top 18 states where refugees have boosted consumer spending power by more than $1 billion on an annual basis, providing significant contributions to the state and local economy. Ohio and Missouri have seen $819 million and $532 million in annual spending activity, as well. Refugees pay more than $100 million in state and local taxes in more than half of the WE Global states, including New York ($625 million), Illinois ($319 million), Minnesota ($227 million), Pennsylvania ($174 million), Michigan ($131 million), and Ohio ($102 million). There is much additional detail about the rate of refugee’s linguistic and civic integration, an analysis of the industries in which they work and start businesses, and their age demographics. The report largely takes a national perspective, with the exceptions noted above. Trump’s curtailment of refugee resettlement could deprive local communities and WE Global states of thousands of new refugee residents per year and tens of thousands of new residents over the coming decade. That’s lots of spending, lots of workers, lots of entrepreneurs, and lots of energy to help revitalize our state economy. WE Global Network has sought to better understand and promote the economic issues surrounding refugee resettlement. In fact, at the WE Global Convening in Syracuse on October 24th, we will host a session on how several local communities and programs in the WE Global Network have sought to quantify the annual economic contributions that new refugees placed in their communities have made. We think that the numbers will tell a story that make many re-think this issue and understand why resettling refugees in our region not only is an integral part of our national character, but significantly contributes to our economic prosperity.